Local elections: What just happened? 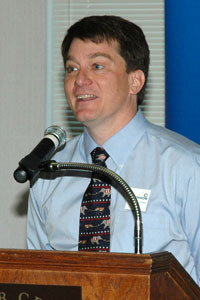 Brian Wheeler spoke at the November 9, 2011 meeting of the Senior Statesmen of Virginia. The meeting was held at the Charlottesville Senior Center. Following the presentation, questions were taken from the audience. The program was moderated by SSV board member Grace Zisk. This occurred on the day after the local elections for Charlottesville City Council and Albemarle Supervisors. Charlottesville Tomorrow’s Brian Wheeler analyzed the results and fostered a discussion about what it means for the future of the community, how these elections will shape our transportation future, our water supply, our rural landscapes, and our city. Brian Wheeler was hired as Charlottesville Tomorrow’s first Executive Director in July 2005. Mr. Wheeler has lived in the Charlottesville-Albemarle region since 1984. He represented the community as an elected member of the Albemarle County School Board during 2004-2010. During 1998-2005, Mr. Wheeler served as Chief Information Officer at SNL Financial, a leading provider of data to Wall Street. Prior to that, he was employed at the W. Alton Jones Foundation, a private family foundation that focused on grant making supporting environmental and international security projects. Mr. Wheeler received a B.A. in Foreign Affairs from the University of Virginia in May 1990. Brian and his wife Jean have two children and currently live in Ivy, Virginia. Charlottesville Tomorrow is a community news platform covering growth, development, and local politics. It connects local residents with vital information for making informed choices about our community’s future. Through a partnership with The Daily Progress, the first of its kind in the nation, Charlottesville Tomorrow’s reporting is now a regular feature in the pages of the local newspaper of record. Comments: Comments Off on Local elections: What just happened?